First you will want to make the frames. This can be done with wood, wood and garden liners, or concrete molds which can be found at a variety of websites by doing a search for "Concrete Molds." If making a simple bench with approximate measurements of 30 inches long, 14 inches wide, and 2 inches thick, you should buy a bottom board measuring or cut to 31" x 15" x 1/4", two side boards at 30-1/2" x 2" x 1/2", and two side boards at 14-1/2" x 2" x 1/2". (refer to diagram A). Nail the boards together. (refer to diagram B, nail placement indicated by arrows). Leave the nails partially out so you can remove them easier. Go to step 3 if you DON'T want to know how to make your own design. If you want a fancier table, you can trace your design onto a bottom board with a thickness of 1/2". 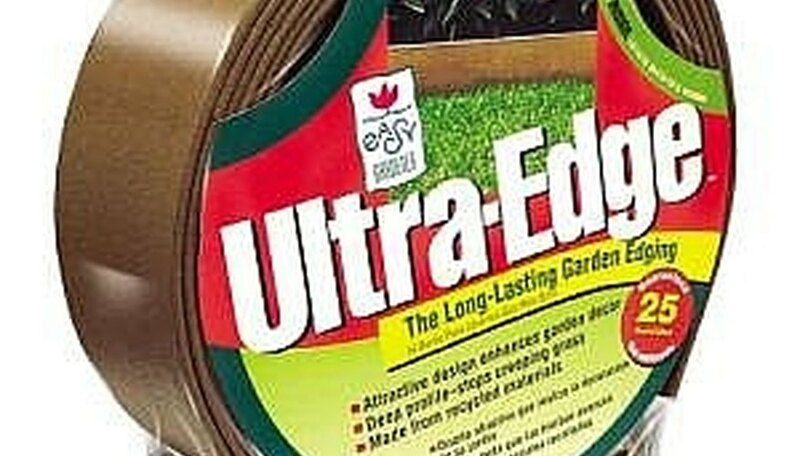 Then using garden edging, like Ultra-Edge found at home depot, (refer to image), you can go around your trace, nailing the edging onto your trace. Remember to leave the nails partially out for easy removal. Next you will want to make a frame for the legs or base of the bench. You can make this out of cement, or you can build one out of wood. 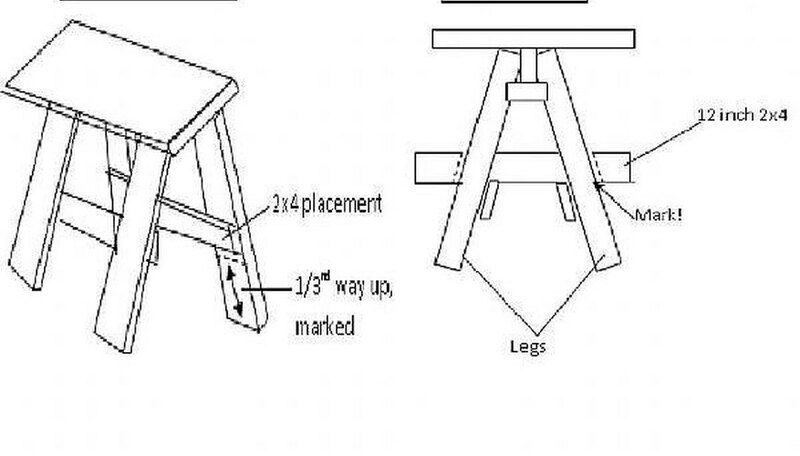 If you have customized your table by tracing a design, these directions may have to be modified in order to fit your bench properly. Go to step 4 if you DO want wooden legs, otherwise continue reading below. For the cement leg frame, you will want 2 side boards approximately 11-1/2" wide x 15" tall x 1/4" thick, 2 side boards 14-1/2" tall x 3" wide x 1/2" thick, and 1 bottom board 11-1/2" tall x 3" wide x 1/2" thick. 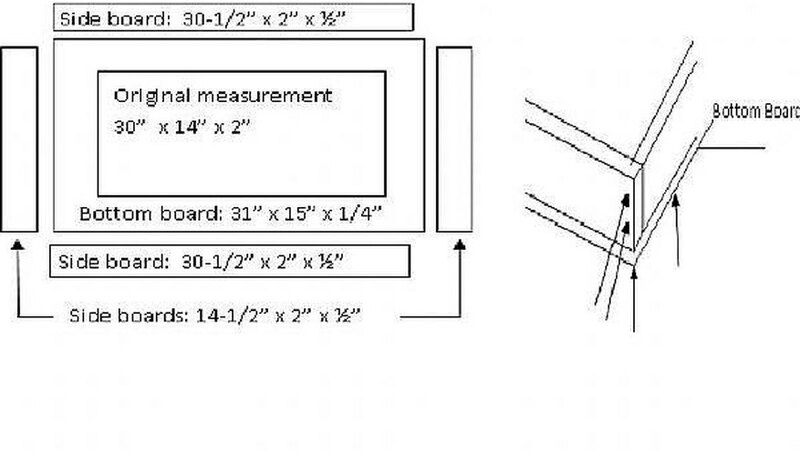 Nail them together as shown by the arrows in diagram C. You can also make your own design by tracing a design onto the 2 side boards that are 11-12" wide x 15" tall. Make sure you do not trace any design lower than 2 inches from the bottom. Keep the bottom board the same and use garden edging as the other two sides. 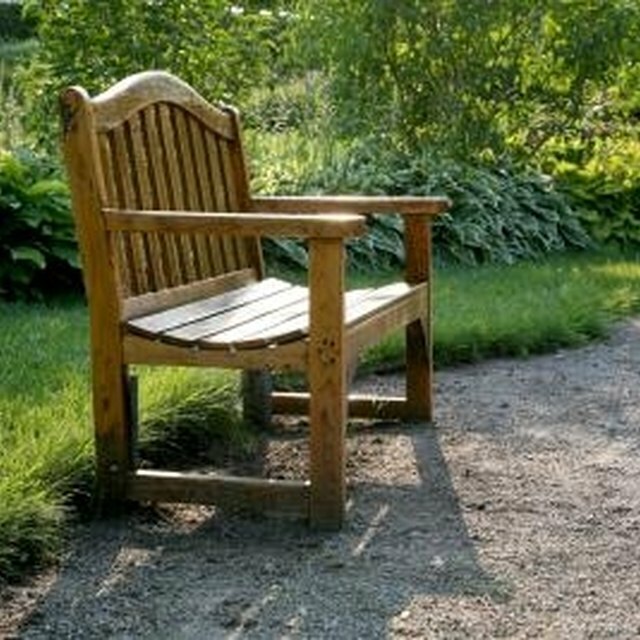 (note: you may have to change the bottom boards width depending on the size of the garden edging width.) Go to step 6 if you DON'T want wooden legs. To make wooden legs you will need: 1 piece of wood 20" long x 7" wide x at least 1" thick, four 2x4s with the length of 20", four 2x4s with the length of the height you want your bench plus one inch (the legs), and two 2x4s with the length roughly 12" wide. Center the 7" wide board with the two 20" 2x4s on each side and draw a line down the center mark, as shown by the dashed line in diagram D,. Keeping the boards centered on each side, nail in the top board with a nail at each end and at least two in the center. Do the same with the bottom 2x4. Nail in the four leg boards with four nails indicated by the arrows in diagram E.
Continuing with the wooden legs: Measure about 1/3 of the way up the inside of each leg and mark it. 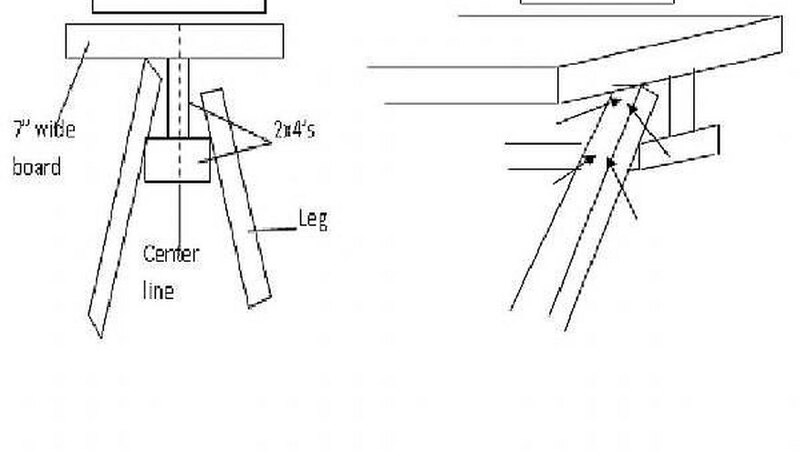 Take the other 20" 2x4s and nail one inside of each side of the legs, shown in diagram F. Lastly, take each of the 12" 2x4's and place one on each side of the stand and mark the angle, as shown in diagram G. Cut at that line and attach to the stand. Stain or design as desired. *you can replace the 2x4's with logs if desire, only one modification is needed, and that is the bottom 2x4 in diagram D is not needed. Now that you have your frame ready, it is time to prep it for cement. You can coat the frame in cooking spray, Vaseline, or a cement retardant to keep the cement from sticking to the frame. After that is complete, in order to add character you can add glass pieces for a mosiac effect, leaves, small pebbles, liners to make the cement have a wood texture, etc. If you don't want the objects to stick in the cement, but just want the indention, you might want to apply cooking spray lightly to the object. If you don't use cooking spray on the items, leaves and items that are fragile can be scraped out if they stick. Now you can mix your cement. Get either ready mix or mix it 1 part cement, 2 parts sand, and 3 parts gravel. Add any cement colorant you desire and poor into your molds or frames, for the frames fill until the cement reaches the top, but not overflowing!. Once any surface bleed water is gone, use a steel finishing trowel to smooth the seat and use a bristled broom to finish the legs. Next, let the cement cure by covering it with plastic, sprinkling it constantly to keep it wet on top, or by using a special curing compound. Let the cement cure for 3 days. Once it is done curing, remove the nails from the frame and carefully remove the frame from the cement. Lightly sandblast the cement or sand it with 100 grit sand paper and an orbital sander to remove any hard edges. Wear a mask to prevent breathing in silica particles. Finish the bench off with a clear high quality cement sealer, or if you want to paint it, see the article: how to paint designs on cement floors, and then put the bench together by placing the seat on the two legs. Concrete, preferably resistant to chipping and cracking. 100 grit sandpaper and orbit sander OR sandblaster. Vaseline, retardant, or non stick cooking spray. Make sure all projects are shaded during the curing period. 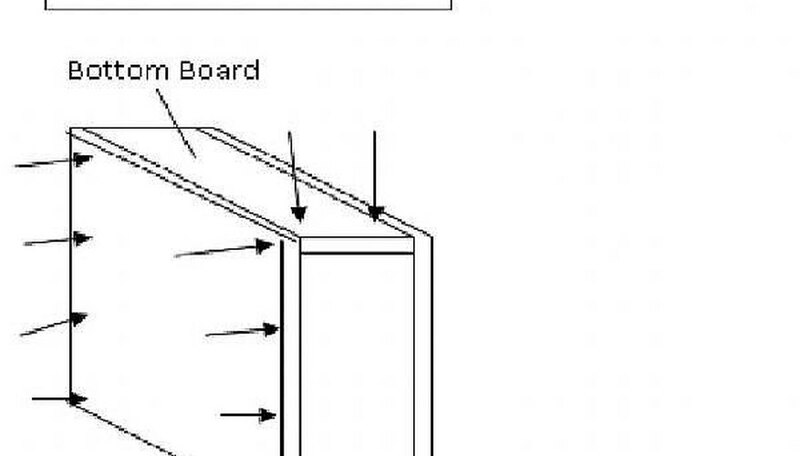 Melamine-coated particle board can be used for the frame if you don't want to mess with cooking spray, Vaseline, or retardant. Wear a mask and goggles when sanding the hardened cement.